If Josh said he felt dizzy, collapsed and lost consciousness, would you know what was happening? Anaphylaxis symptoms range from a swollen tongue and difficulty speaking to collapse and loss of consciousness. Most allergic reactions are not anaphylactic and can be treated with anti-histamines. But in more serious anaphylactic attacks adrenaline is required to be injected into the upper outer muscle of the thigh. Within minutes swelling is reduced, wheezing relieved, and blood pressure improved. 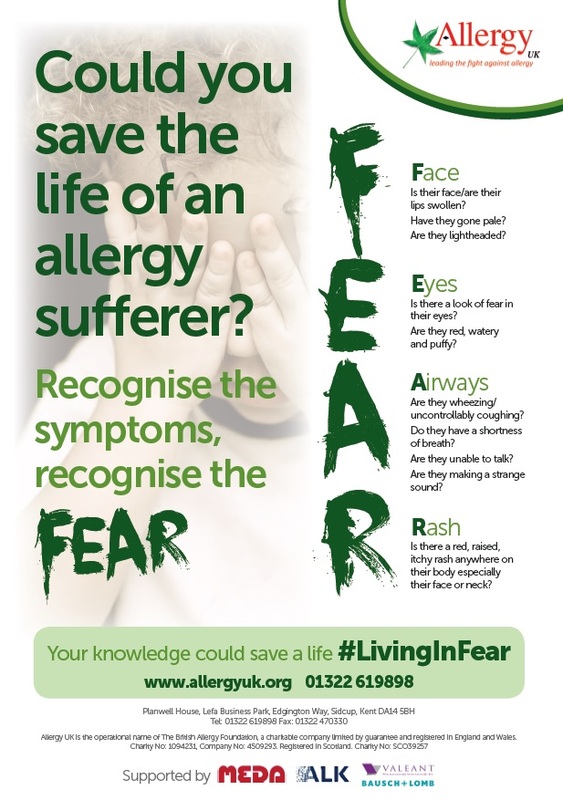 Allergy UK have a handy acronym to recognise the symptoms of a reaction: FEAR! Face, Eyes, Airways, Rash. As part of Allergy UK’s ‘Allergy Awareness Week 2016’ see Allergy UK’s website for more details.